First week of freshman year of college, my older, wiser sister came to visit us in Bloomington, Indiana. She took one look at my friends and me and said, “Are you ever going to stop dressing granola?” I don’t know if I would have called myself granola then or now (though I’ll admit, I had a ragged and beloved pair of Birkenstocks to match cargo pants in every color), but one thing I know for sure is that I start every day now with a big bowl of homemade granola. 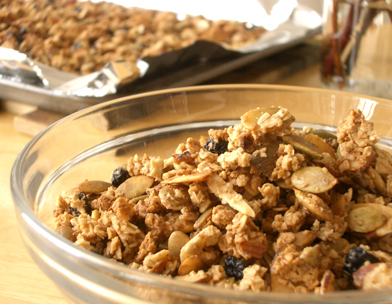 It’s more yummy and cheaper to make than any granola at the store, and it’s easy to make, to boot. I try to make enough on Sundays to last the week, but it’s so delicious that we don’t always get through. Eat it over yogurt (more about homemade yogurt to come) with fruit, and you’ll be full ’til lunch. Mix all the ingredients, except the raisins and bake in a 9×13 glass dish at 300 degrees for 20 minutes. Remove from the oven and add the raisins. Enjoy by itself, with milk or over yogurt. I rarely measure when I’m cooking, so all of these measurements are approximate. Change as you please! This looks delicious! I will definitely try to make it. Also, love the trip down memory lane and the reminder of our amazing fashion sense freshman year! 20 oz. hope you’re doing well!